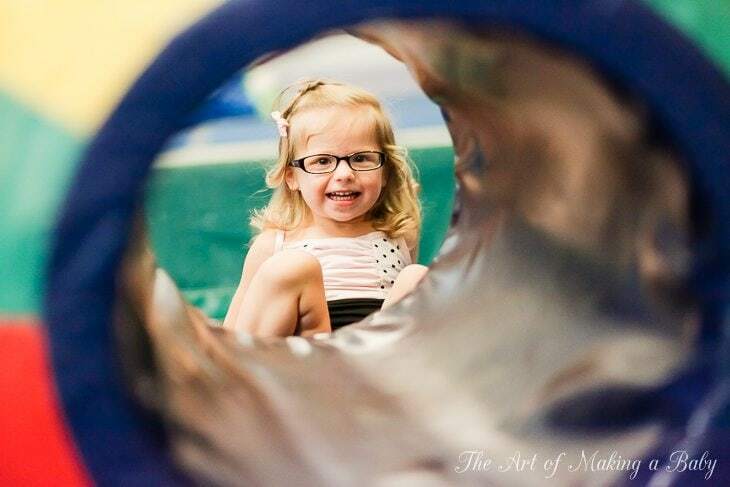 I wrote about all the activities that Lexi participates in and one of her absolute favorite ones is gymnastics. 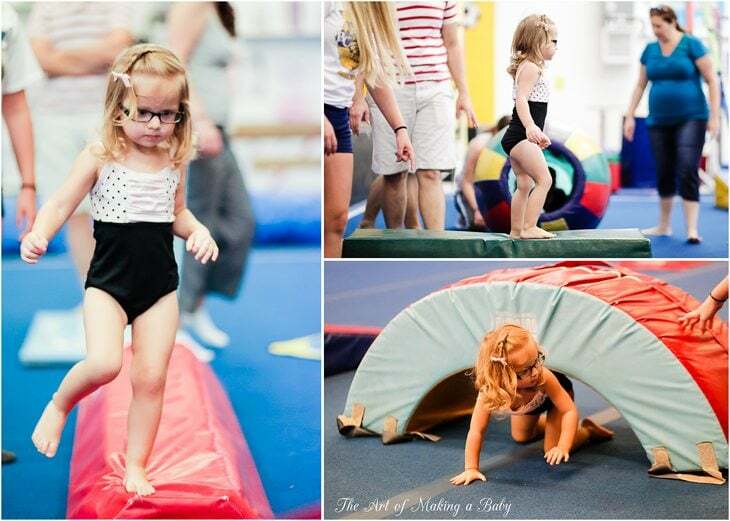 There is open gym twice a week and an organized toddler tumble class once a week that she is obsessed with. 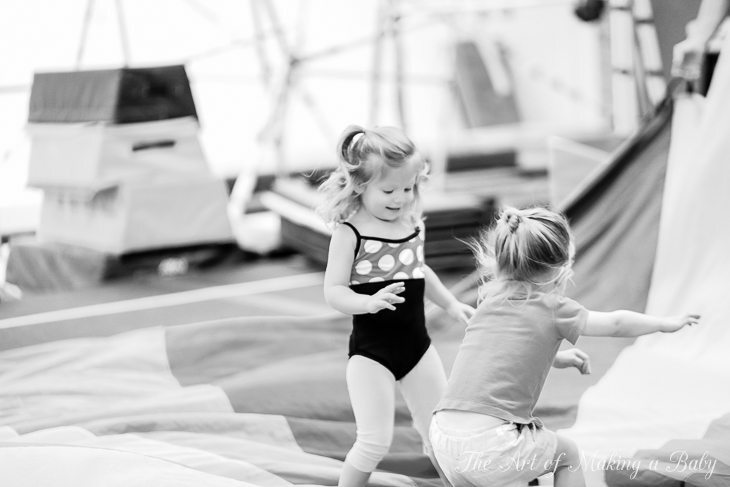 She loves following the instructor ( and sometimes NOT following and running around like a goofball) and it’s a great opportunity to get introduced to flips, tumbles, handstands and other fun gymnastics basics. I took my camera to two of her classes about a month apart and I am SOOOO happy with the pictures that I managed to capture. I will cherish these for a long time and I know Lexi will get a kick out of them when she grows up, too. 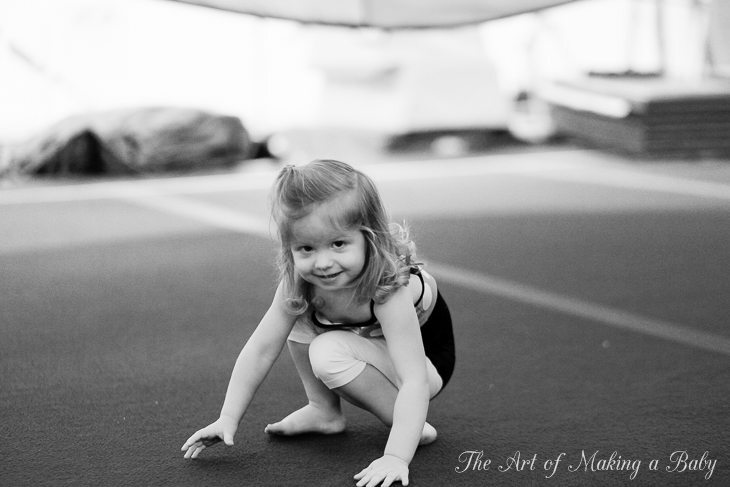 I know I am a mom and I am completely biased but she is really good at gymnastics. Not like “unique talent good”, but just really good. 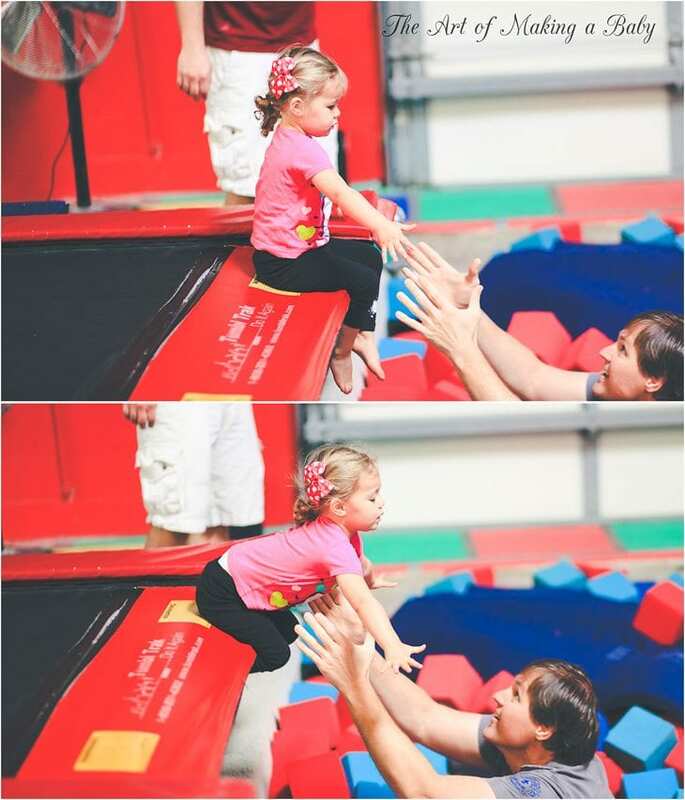 She took to it on Day One and was showing incredible balance and strength for “not yet a two year old”. She manages to do everything that is thrown her way and does it really well. Her arms and legs are really strong, she has good balance and a lot of excitement for the “sport”. There was only one other girl about a year older that exhibited this kind of strength and for some reason she stopped coming, which is a shame because I would have liked Lexi to be able to watch someone who’s really good at it, too. Also, this class was the first one that we got Lexitwins to jump into the pit. Before that, the pit was the ONLY thing “my Lexi” wouldn’t try (I’m glad she has enough sense to not jump off into a pit without ensuring it’s safe, because often it seems like she can do very careless toddler things that can get her hurt), but then Brian (Lexitwin’s dad) managed to coax her into it and Andrew helped Lexitwin jump in to. The rest is history, they both now jump without any fear. 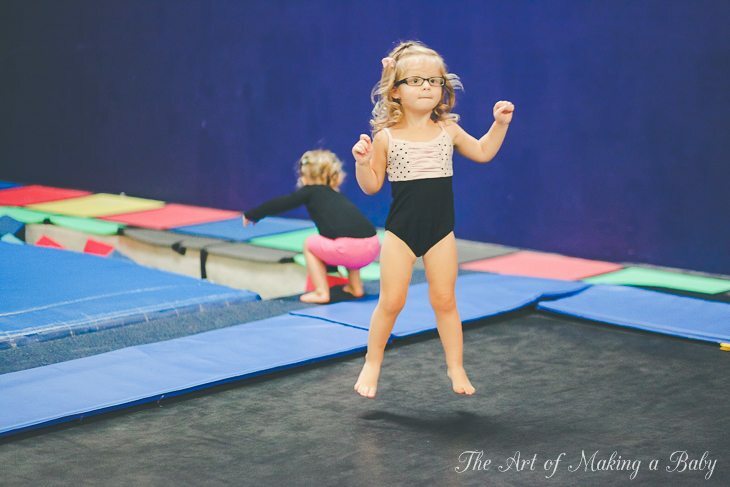 Also note for parents with more cautious kids: not everyone just “jumps into” gymnastics ( pun intended); for more cautious, sensitive type kids it might be too much the first few times and they could be unwilling to do anything, because all the equipment is scary. You have to have a lot of trust or be fearless (which luckily most kids are) to do this right away. The reason I say that is because Lexitwin would cry through pretty much the first 14 weeks of classes. She wasn’t being MADE to do anything, but as soon as it would be her turn, she would just freak out. So her parents spent the first 14 sessions of this class patiently helping her through it, encouraging, coaxing and working with her on the few things she did agree to do. It was very frustrating for them and they even considered dropping the class but it worked, for the last 2-3 sessions, she has been eagerly doing everything else with the group and didn’t cry once. She was allowed the space and the time to sort things on her own, conquer her fears, realize that it’s not that scary while still being exposed to it and she now greatly enjoys the classes. I think that’s a great example for parents who are struggling with sensitive kids. 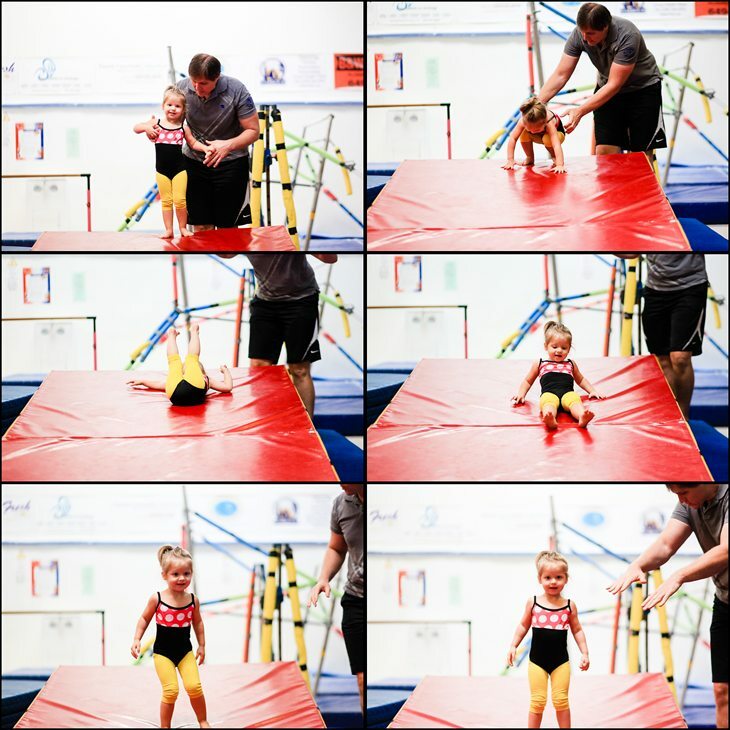 You can see Lexi gymnastics videos here. Thank you for this post! 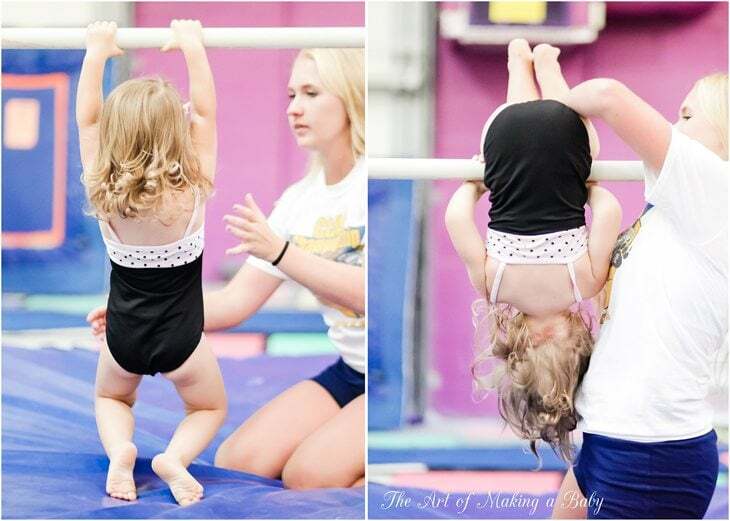 We just started gymnastics a month ago and our daughter hasn’t taken to it yet. She enjoys it, but she gets overwhelmed by the other kids and won’t do most things there. 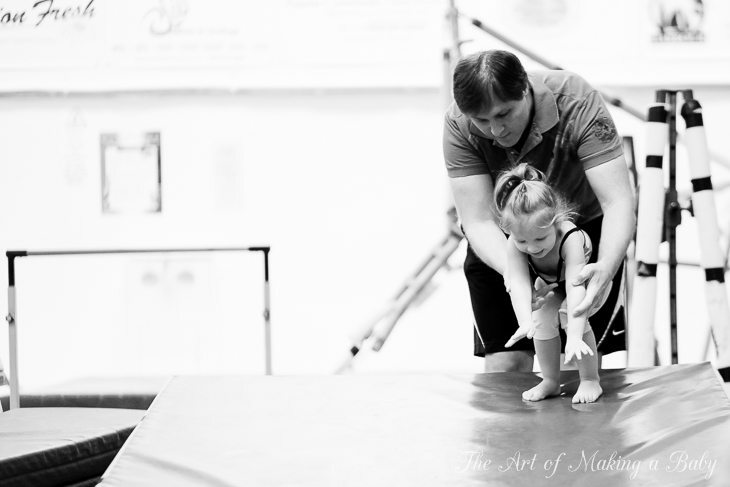 She loves the balance beam, so that’s great, but she won’t try the rings or the bars. She also doesn’t wait with the other kids. She has always been enrolled in classes (she’s 2, too) so she’s been around other children but not much. She really has to work on the socialization thing in time. I have hope if Lexitwin now enjoys it! I’m not giving up! She asks to go, so I know she likes it and I think she just gets overwhelmed when we are there even though it’s a semi private class with only 2 other kids. PS – Where did you get her those adorable outfits? Zulily! 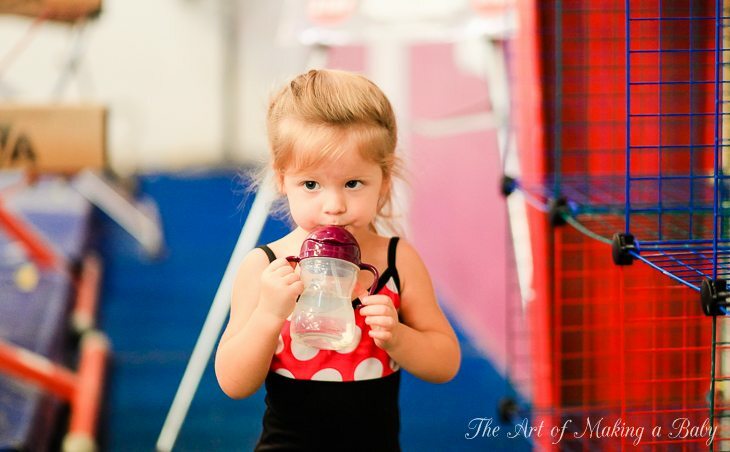 Occasionally they run sales for super cute gymnastics brands. You just gotta watch it! I was so lucky to get those outfits just when she started. I hesitated not sure if we’d wear them but they are the best. I’ll look up to see what brand they are. Chelsea, quick go to zulily! 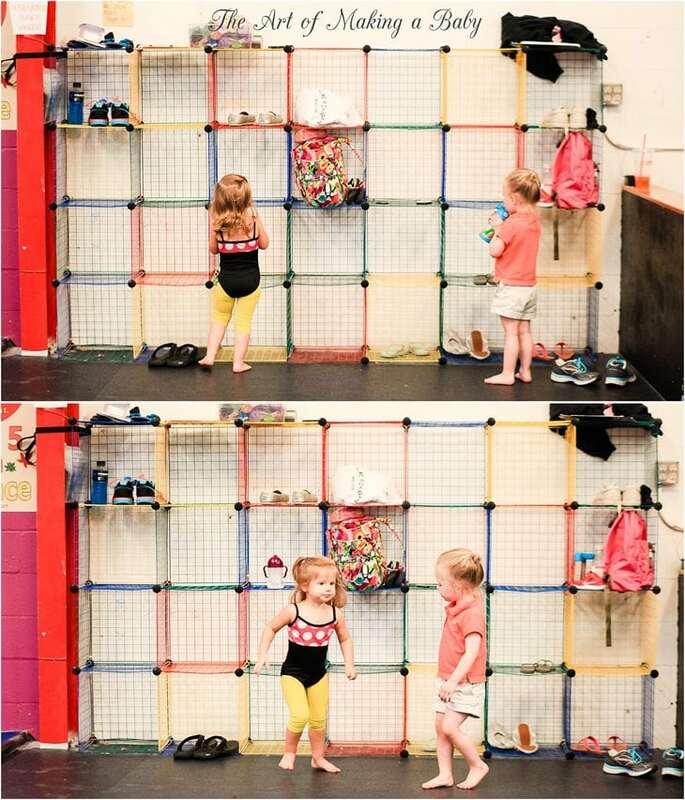 They have some super adorable gymnastics and dance outfits. Got a few! Thanks so much, Elena!! 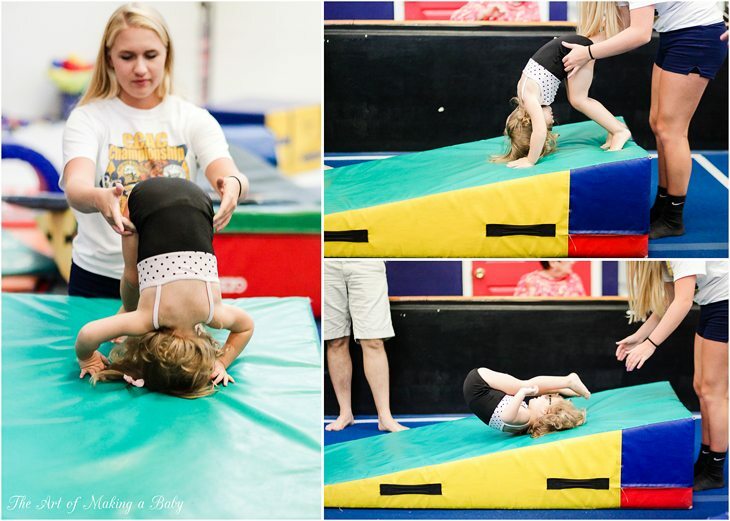 I too am encouraged by Alexa’s progress (and I really empathize with her parents) since my DD is also a reluctant gymnast. I think I am going to try again in the fall and maybe do a drop- in here and there until she’s familiar with the space. I agree! 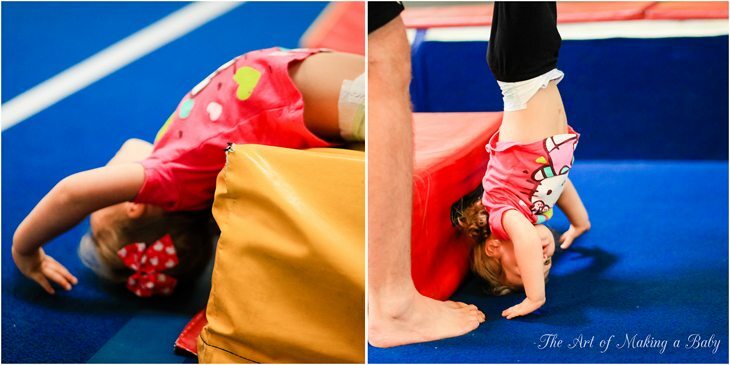 Lexi is AMAZING at gymnastics. 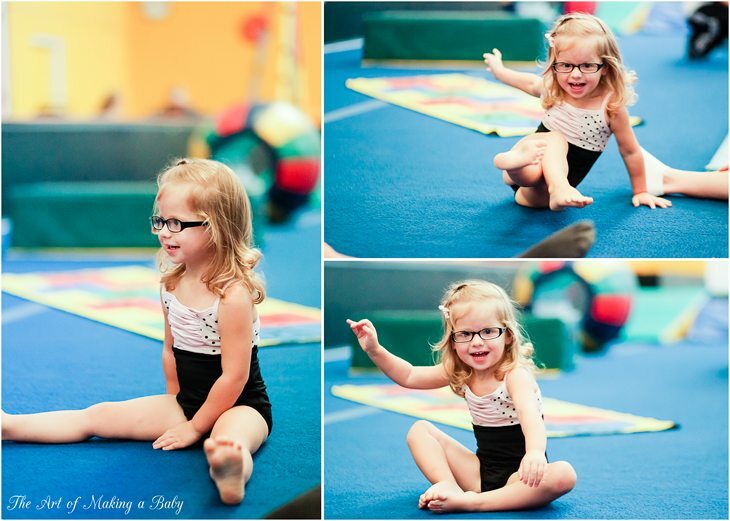 It’s really unbelievable to see all she can do because I take my daughter to gymnastics and no one is that good. The other two kids are 3 and Lexi is far more advanced. I’m so happy she is enjoying it! Mrs. Loquacious, hopefully our little ones will start liking it soon. I’m still taking my daughter weekly because she likes it, she’s just not really following directions or doing some of the activities. Hopefully with practice and patience she’ll start to really love it. I have been reading your blog for a long time and just wanted to say Lexi is a cutie. 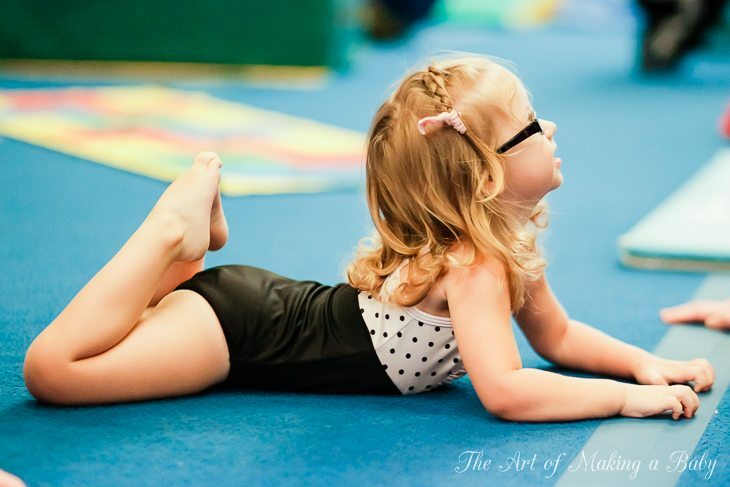 I was just wondering in terms of toddler gymnastics what makes Lexi seem “more talented” than other toddlers her age in the terms of tricks or skills she has that other kids her age may to be able to master? Is it something you can see yourself pursuing (if Lexi is still interested of course) when she gets older on a competitive level. 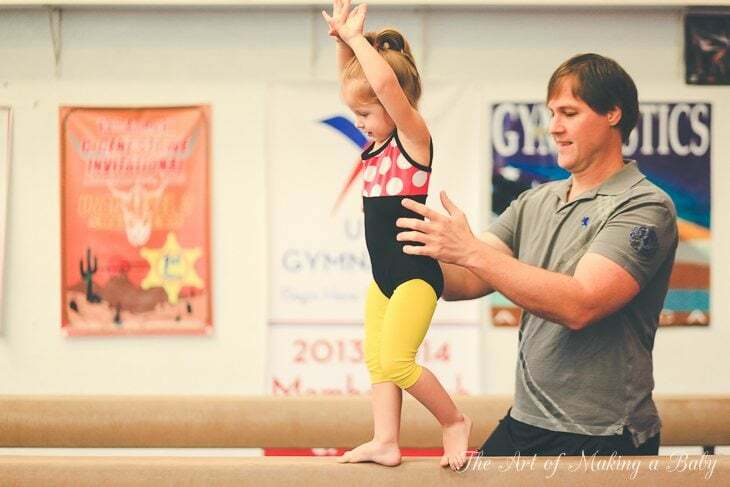 Do her coaches and teaches say that because she seems really good now that it looks promising for her to continue to be at an above average skill level as she grows older. Just curious because I have a few nieces who now compete in their age group which is late elementary school and Jr High and they seem to love it but it is definitely something that takes a TON of time money and dedication. 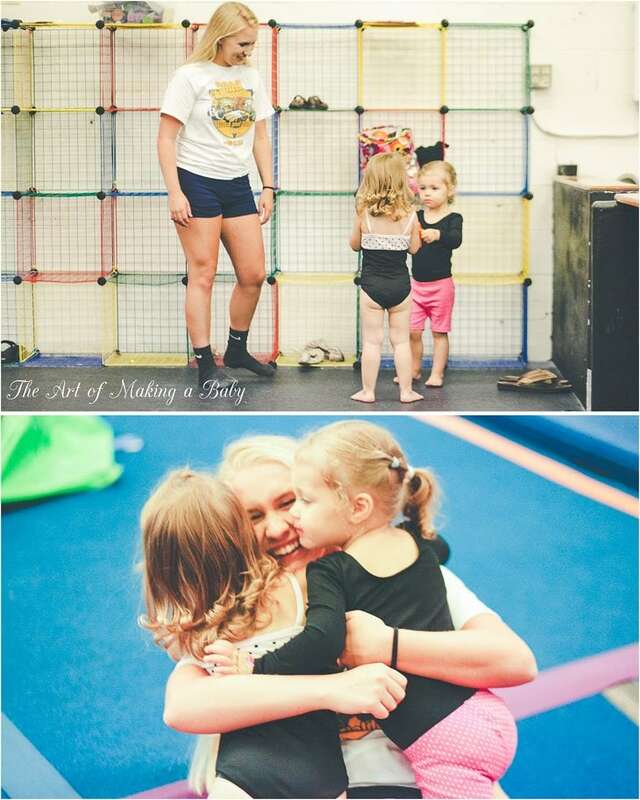 I am sure it is probably too early to tell but I am just curious because it amazes me how much time and energy these little girls put into their sport at such an early age. 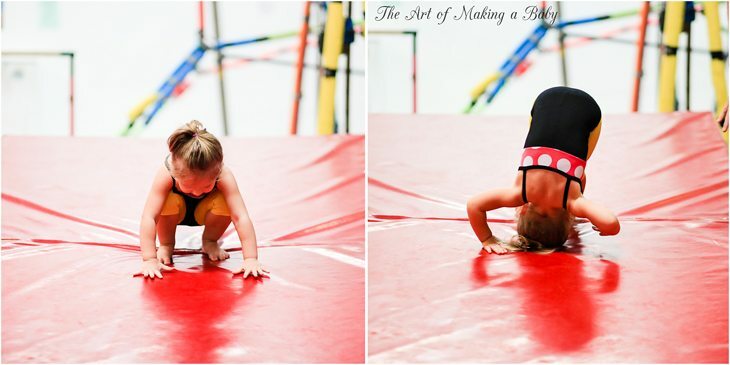 I don’t think you can determine at this age whether someone is going to go pro in gymnastics or not. Children develop at different speeds and one kid has better balance and strength at one age but then his peers catch up to him. 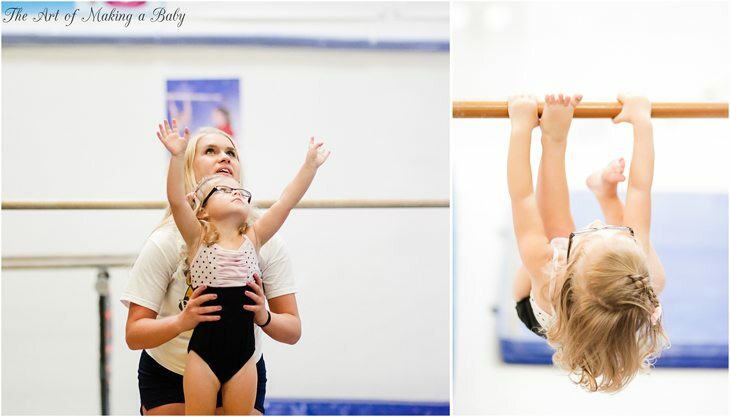 That’s why I am not really putting much thought into how she is doing at gymnastics aside from noticing that she is very enthusiastic and very strong and balanced. I feel a lot of it comes from enthusiasm and fearless nature of her personality more than talent or skill. 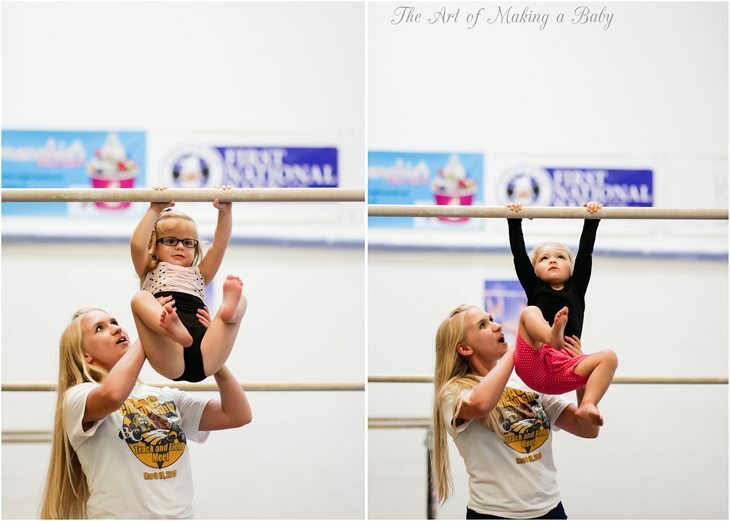 If asking what she does that most other kids her age dont: pull up on high bar, bring her legs up while hanging, walk on balance beam unassisted ( for a short period of time since she runs rather thane walks), does the rings really well and hang for a long time while swinging and bring her legs up to her feet. That kind of stuff. 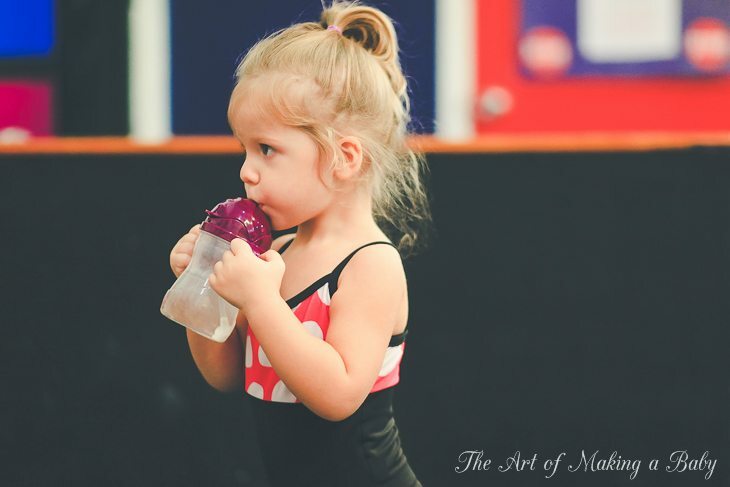 I’ve seen one three year old who can theoretically do that based on how they perform on other equipment but no two year olds or most three year olds. But like I said I think it’s just general strength and enthusiasm more than anything. Teachers at that age are there to introduce them to concepts not predict who’s going to be a pro or praise one kid over another. We will continue until she no longer finds pleasurable. 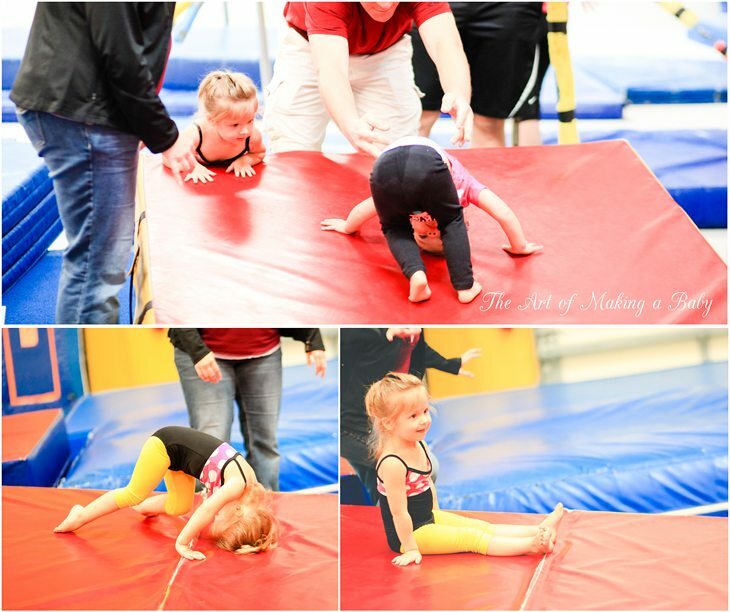 C loves her gymnastics too! 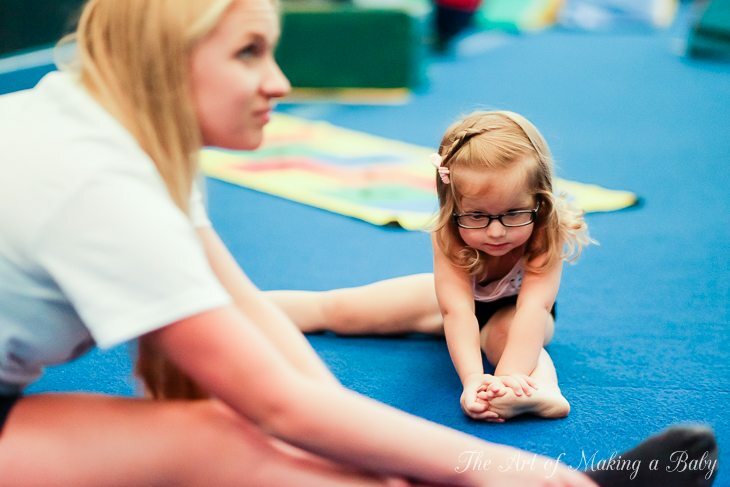 Ours is more of an open gym than an organized class, but she loves it all the same. She won’t do the trampoline because it’s too much of a structured thing. Everyone stands and watches (while waiting their turn) and has 1 min to bounce. The time track, on the other hand, is a favorite! 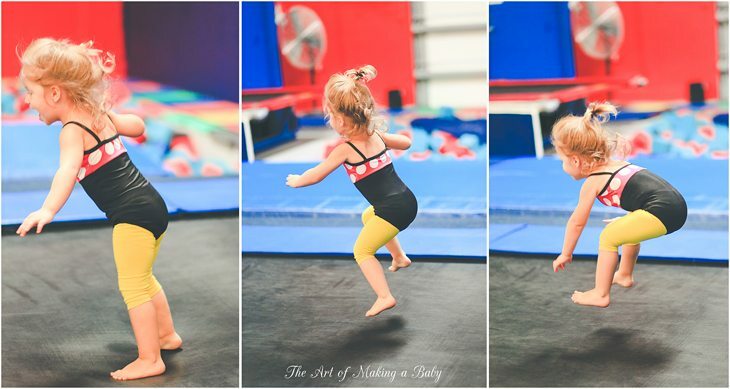 She shows amazing control of her body going from a run to a jump instantly. We’ll be sad to have the summer off. 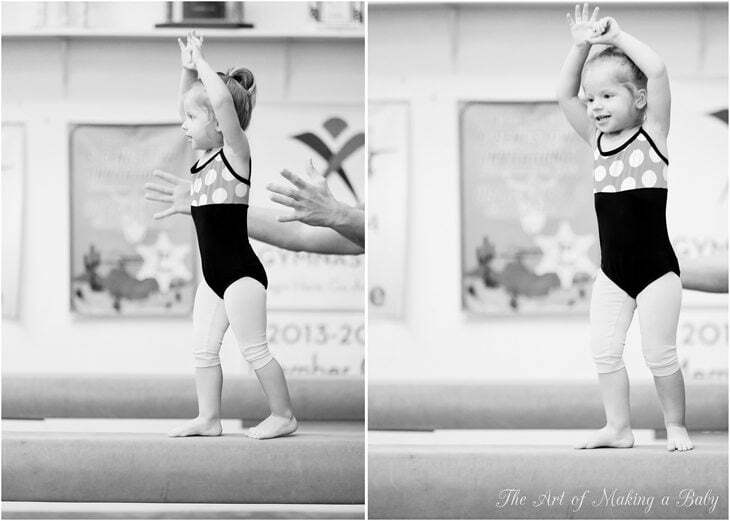 I’m thrilled because my little one did GREAT at gymnastics today. She has made such progress in 4 weeks. 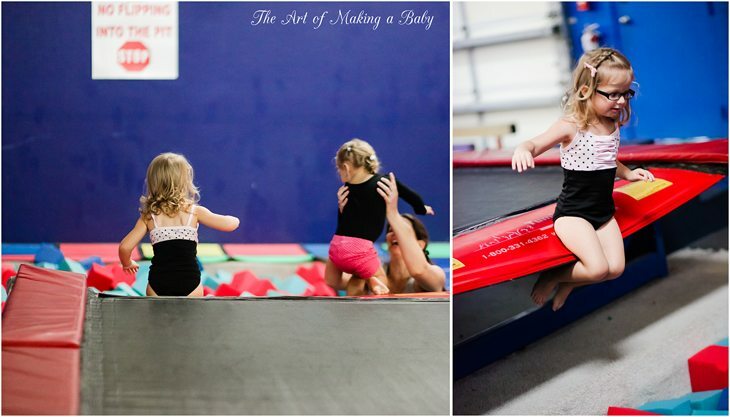 It’s a wonderful activity for toddlers! Oh yay!!! That’s awesome! They all get there at some point! I bet you’re so proud!!! That was supposed to be tumble track, not time track. ANYWHO! She doesn’t mind taking turns for anything else, but I think she’s just too intimidated by the big trampoline with everyone watching. She’s one who likes to test things out a few times to get the feel of it before really going at it. She did the same with the tumble track where she’d walk slowly feeling it under her feet a few times before finally just running full speed. I think with the big trampoline she feels she can’t really do that. Well, you’ve inspired me to sign DD up for a trial class! I have a question though, maybe a silly one, but whatever. 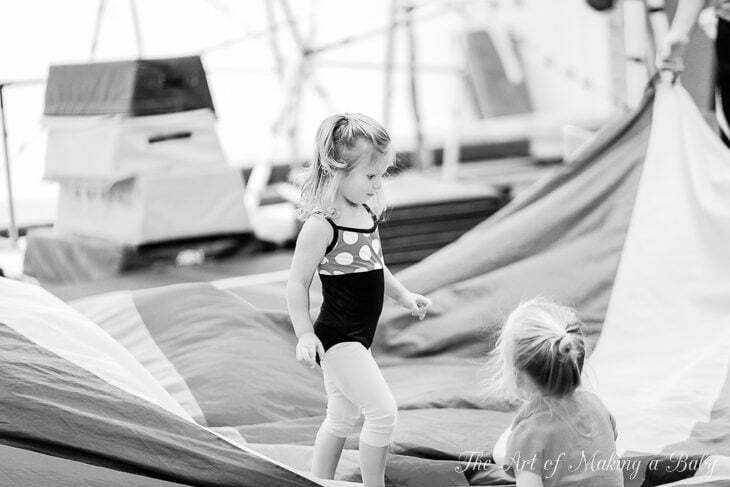 =P When Lexi was still in diapers, did you put her in disposables for gymnastics? It seems like cloth would be rather bulky and hinder movement a bit, so I’m wondering whether I should put her in disposables so she can have better freedom of movement. We only were in diapers for a month or two before she potty trained herself and that point she was wearing disposables exclusively cuz she grew out of her bum geniuses. 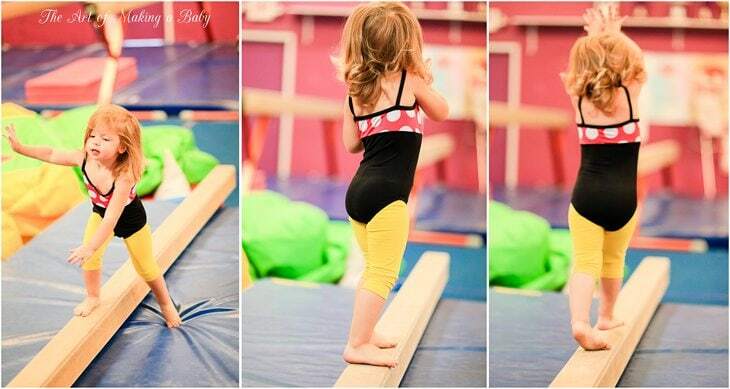 I personally do not think that cloth diapers will bother her because of the simple exercises they do at this age. But you can try both and see. Also did you sign up for an actual gymnastics class or something like mygym? Huge difference there. Ah, in that case, I’ll see how it goes with cloth before I run out and buy ‘sposies. I’m probably WAY over-thinking things, especially considering that she’s been running/jumping/climbing just fine in cloth for almost 2 years now. Hm, I signed her up at a place called The Little Gym. 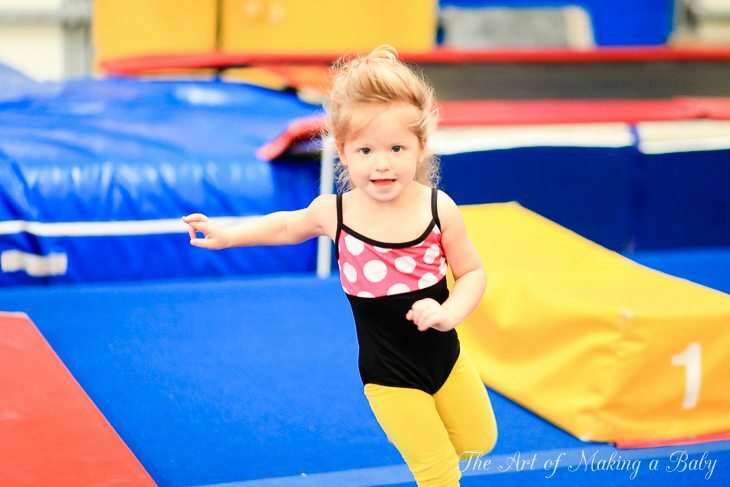 After poking around their website, it looks like they offer actual gymnastics for ages 3 and up, but their descriptions of the classes they have for younger kids are pretty vague. 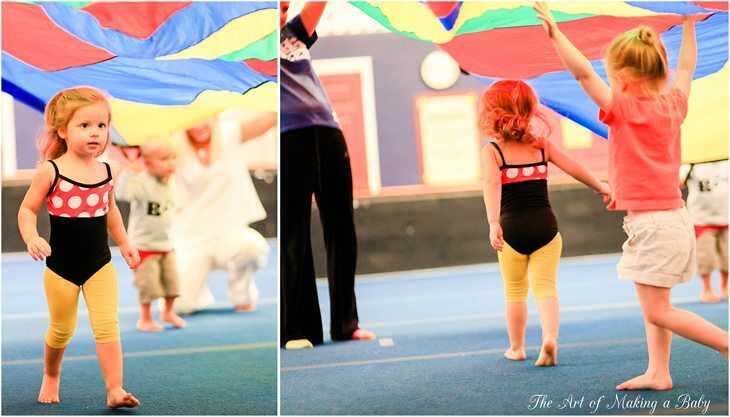 Based on your experience, what would you recommend looking for in a toddler gymnastics class? I guess what I mean by that question is whether the class is in the special gymnastics facility. 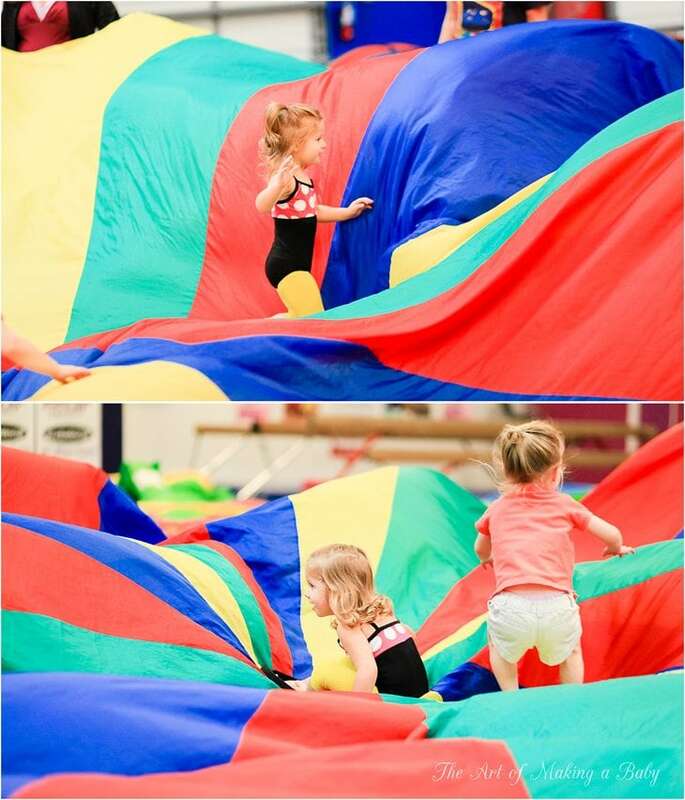 We used to go to mygym which is designed for smaller kids and she grew out of the clapping and singing and 5 minutes of pseudo gymnastics before she turned 1. As long as they use the real equipment and teach them basics rather than sing songs and walk in a circle, you’re good. 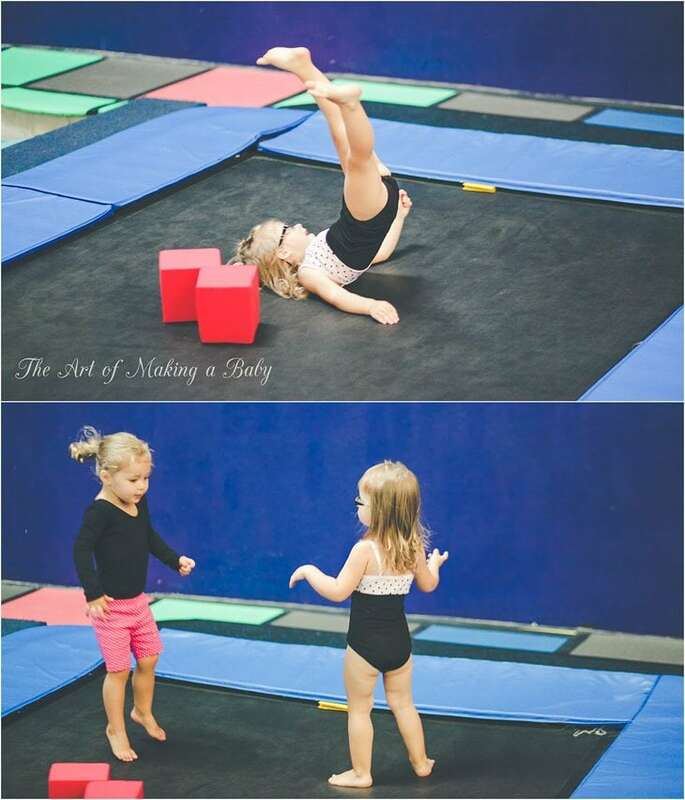 Usually they are called tumble classes. Ohh, okay. We tried a few mygym style classes several months back, and she wasn’t a fan of that. 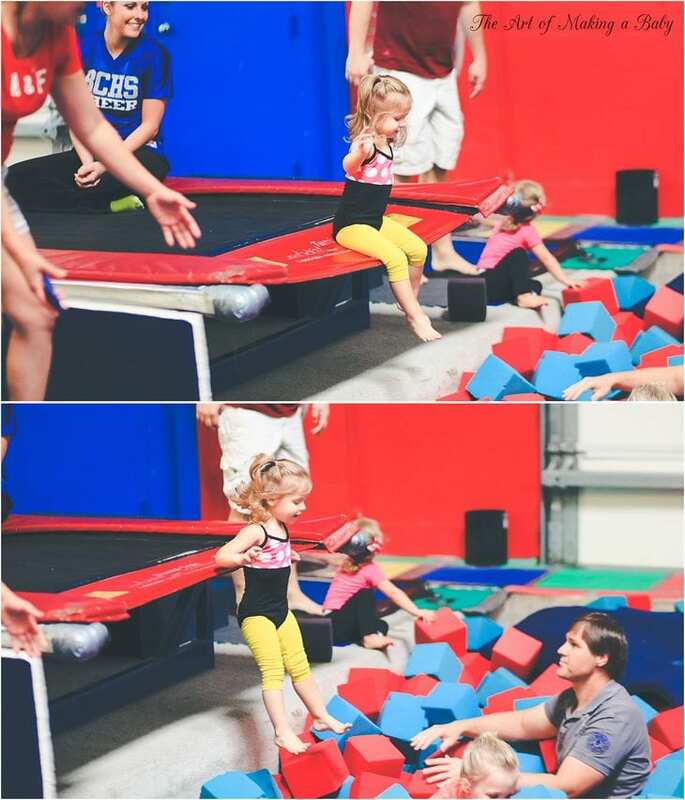 It looks like the place I’m taking her has more of a tumble style class. I guess I’ll find out for sure next week! I am catching up on your posts and this one makes me SO EXCITED to have a little girl! You are such an inspiration and motivation to me. Right now she is 2 months old and the current skill we are working on mastering is sleep. lol I can’t wait to see all the things that are ahead for her. 🙂 OK, just wanted to share.